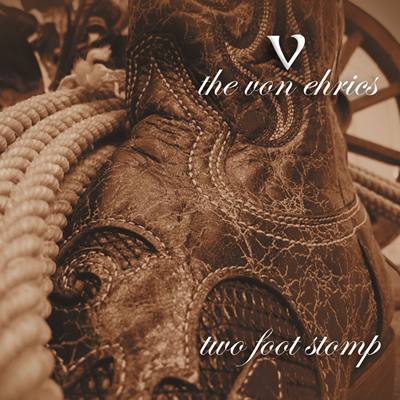 Whiskey slinging, Texas cowboy punks The Von Ehrics, will be releasing their new album TWO FOOT STOMP on Lucky Buck Records. Dispelling any myths previously associated with their wrestling family namesake, The Von Ehrics are here to stay. They will also be touring in support of TWO FOOT STOMP with a new line-up which now includes original members songwriter/vocalist/guitarist Robert Jason Vandygriff, and Gabe Aguilar on drums along with new bassist Paul “Santi” Vaden (Ghoultown) and new guitarist Clayton Mills (Dixie Witch, Riverboat Gamblers). The latter two musicians contributed and performed on TWO FOOT STOMP as well. The foundation for TWO FOOT STOMP took form a little over a year ago in February. The guys set up shop in Denton, TX, writing and rehearsing almost nonstop for seven months before entering The Echo Lab with Dave Willingham (Polyphonic Spree, Earl Harvin Trio) in September. The result is a dozen songs structured in traditional gospel and country with super-up-tempo Mould-like melodies and soulful vocals. The commitment to simple but detailed arrangements creates what front man Robert Jason Vandygriff describes as "well-thought out, authentic and true to what people expect at our live shows." Time is another character and a central theme of the record as well. Unlike whiskey, it is the one thing that has truly been a rare commodity for The Von Ehrics since forming in 2000. TWO FOOT STOMP is the only record the band recorded off the road. It’s that work ethic and relentless touring schedule that built the band a solid following throughout the US. Over the past decade, The Von Ehrics have shared bills with a litany of acts such as The Riverboat Gamblers, Reverend Horton Heat, Mudhoney, Billy Joe Shaver, GBH, Supersuckers, Dale Watson and Old 97’s, among many others. Known for their mayhem, the Von Ehrics kick started their US Tour on April 15th at La Grange in Dallas, just a few days prior to the release of Two Foot Stomp on April 19th. Fall/Winter tour dates to be added. Please check back here for updates. The Von Ehrics have finished their newest record to be released by Lucky Buck Productions. The album, titled Two Foot Stomp, is set tp be released April 19th, 2011 with CD release shows to happen in Dallas, Austin, Charlotte, New York and Chicago. Tour dates to follow will be announced in the coming months. The band also plans to give away a free mp3 on its website more than a month before the record is released. The Von Ehrics will celebrate their tenth anniversary in 2010 and have plans to release their fourth full-length album late that year.